The Green Phone Booth: Time to Start Planning for Christmas? I have already started making Christmas gifts and collecting supplies. I'm hoping to make more homemade gifts this year so I want to get an early start. Most years I'm rushed so hopefully this way I won't be. I can't share the ideas for what I'm making this year since people I'm giving them to may see this but I have collected some other ideas that can be made in an eco-friendly manner. 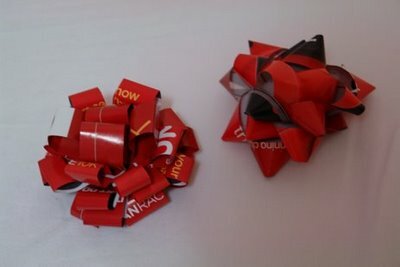 Gift Bows from Magazines- These are easy and fun to make. Just need magazines and metal brads. Buttercup Purses- If you sew these are super cute and would make wonderful gifts. Microwave Soy Candles- This is the easiest candle craft I have seen. You could whip up several of these in no time. Heating Pads/Ice Packs- These look very simple and are a great gift for anyone with pain issues or that is always cold in the winter months. They can be heated in the microwave or kept in the freezer for icing injuries. Homemade Vanilla Extract- This is a fun and easy gift, that is great for any baker on your list. T-Shirt Reusable Bags- You can pick up some cheap t-shirts at your local thrift store for this project. You can even use the bags as wrapping for other gifts. No-Knit Scarf- Even if you don't knit or crochet you can make this cute scarf. Ribbon Bookmarks- These would be great to go with a book for a gift. Popcorn Tins- Make homemade popcorn tins. This should of course be done closer to Christmas but you can start looking for tins now. These are just a few ideas, would love to hear your ideas as well. Homemade gifts are such a fun way to save money, stay green, and give more meaning with your gifts. I am going to have to steal a few of these ideas! My daughter is learning to crochet so I may encourage her to focus on a project too.